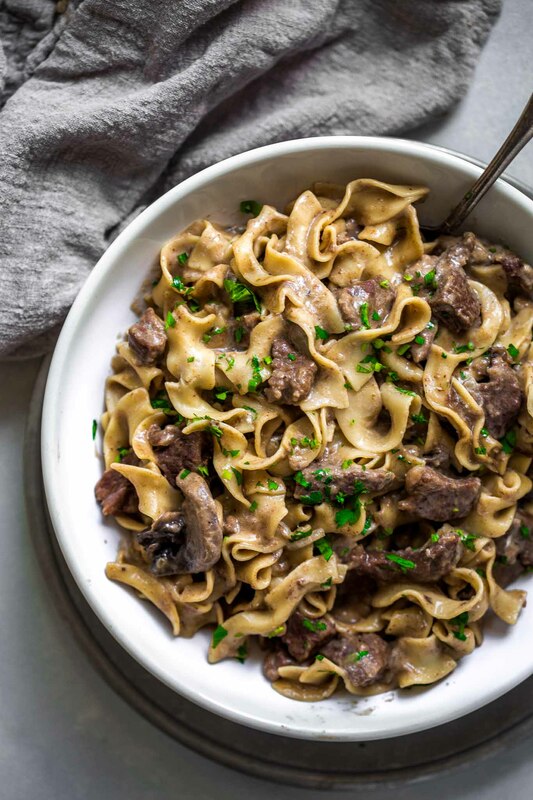 Growing up beef stroganoff was always one of my favorite meals – Granted it was Hamburger Helper and it probably took a total of 20 minutes to cook up, I had very undiscriminating tastes at that age. I’m cooking up a more “adult” version today – Slow cooked and spiked with brandy, it develops itself into a rich dish with a creamy sour cream based gravy that is just… so… good! I like to serve it the traditional way, over buttered egg noodles, with an extra helping of sour cream and a sprinkling of chives. How Do You Make Traditional Beef Stroganoff? The meat is coated in a flour-spice mixture consisting of garlic powder, nutmeg and salt and pepper. I love to incorporate nutmeg into rich meat dishes because I feel like it adds an extra layer of depth to the dish. It’s that something that you can’t really pick out, but it adds just that little something. Once coated, the meat is browned, adding even further to that great rich flavor. Don’t crowd your pan during this step. Doing so causes your meat to steam rather that brown. We’re looking for that browned bit goodness here. After browning the meat, it’s tossed together with some sauteed onions, doused with brandy and wine (this makes me smile) and given a beef broth bath. Let it simmer away for an hour an half until the meat is just about tender. At this point, we’ll add some sauteed mushrooms to the mix and let them join the party for 30 minutes, just to get those flavors really meshing together. Taste for seasoning and add additional salt, pepper, nutmeg and you’re ready to serve. What Cut of Beef Do You Use for Stroganoff? For this Traditional Beef Stroganoff recipe I’m using a chuck roast. This cut of beef, when cooked low and slow, ends up being super tender and flavorful. A low, slow cook time makes this beef stroganoff extra tender. I simmer this stroganoff for 1 1/2 hours on low heat. I serve this Traditional Beef Stroganoff with buttered egg noodles. You could also serve it with rice pilaf, mashed potatoes or crispy roasted potatoes. What are Good Side Dishes for Beef Stroganoff? 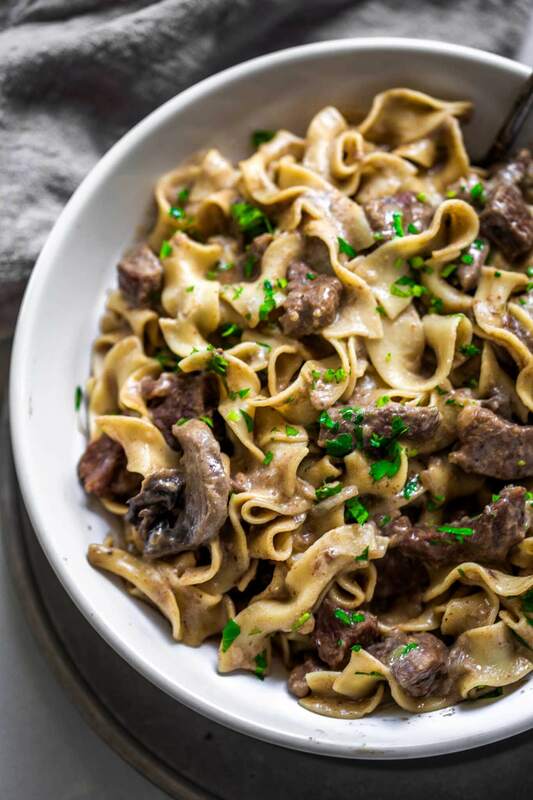 If you loved this Traditional Beef Stroganoff recipe I would appreciate it so much if you would give this recipe a star review! Also, be sure to snap a picture of your finished dish and share it with me on Instagram using the hashtag #platingsandpairings and tagging me @platingsandpairings. In a large bowl, combine 1/3 cup flour, garlic powder, nutmeg, 2 teaspoons salt and 1/4 teaspoon black pepper. Pat the beef dry with paper towels and add to the flour mixture in the bowl; toss to coat. In a Dutch oven, heat the oil over medium-high heat. Working in batches (don't crowd the pan), add the beef and cook until browned on all sides. Transfer to a plate. Reduce the heat to medium and add the onion. Cook, stirring often, until softened, about 4 minutes. Add the brandy and wine and cook, scraping the pan with a spoon, about 1 minute. Return the meat to the pot and add the beef broth. Bring to a boil, reduce heat to low, cover and simmer until the beef is tender, about 1 1/2 hours. Transfer one cup of broth to a small bowl; add the remaining 3 tbsp. flour and whisk until smooth. Add the flour mixture to the pot. Season to taste. In a large skillet, melt the butter over medium heat. Add the mushrooms and cook, stirring often, until golden brown, 5-7 minutes. Add the mushrooms to the meat mixture. Simmer 30 minutes longer. Stir in the sour cream and season to taste with salt and pepper. Serve stroganoff over buttered noodles. Garnish with additional sour cream, plus chopped chives. Have an Instant Pot? 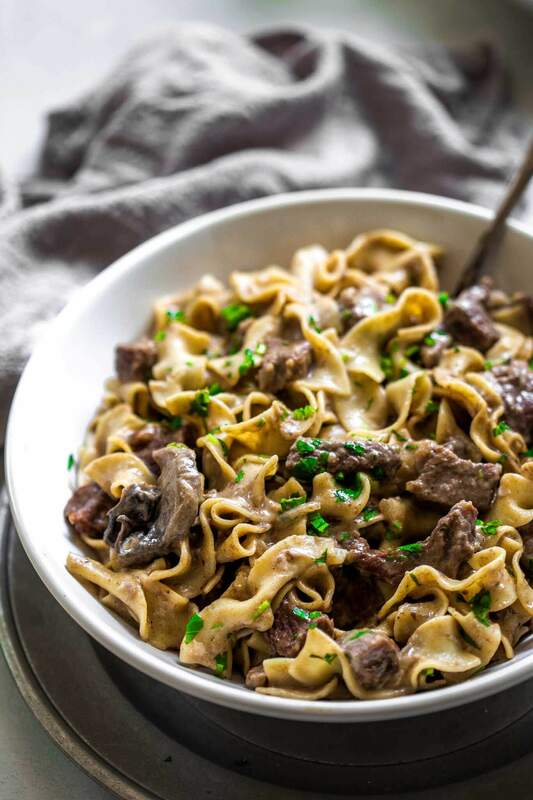 Try this Instant Pot Beef Stroganoff too! This recipe was originally published in May 2015. It was updated in January 2019 to revise the photographs and content. The recipe remains the same. To balance the rich flavors of the dish, try a rich, fruity wine such as a Grenache or a Shiraz. Dry Rosé is another great match. The acidity balances out the richness of the dish. I LOVE beef stroganoff, and your recipe looks so delicious!! I think what I love most about beef stroganoff is how nostalgic it is! It always reminds me of childhood. Your version looks so creamy and delicious, definitely adding it to my menu! Beef stroganoff is such a great comfort food dish. I love the idea of using brandy. Definitely trying your version! Thanks Michelle – I hope you love it! The brandy really did add such an interesting touch and great flavor! That’s funny, beef stroganoff was my favorite comfort dish as well as a child…also h. helper for sure. This looks so delicious, I like the idea of adding nutmeg to deepen a rich meat dish. Thanks for sharing. This looks so perfect for the cold weather we’re having!! Yes!! It’s been SO chilly outside and this is definitely comfort food for the season! I love beef stroganoff! I’ve been making it in the Instant Pot lately, but love your recipe. Brandy AND red wine?! Yes, girl! I hope they love it Melissa! Ooh the flavors you’ve added make such a nice addition to a wonderful dish. My mom also made stroganoff a lot growing up, but I think it was a few steps above hamburger helper! I haven’t had it for years, I’ll have to try your recipe. Where do you add the onion? It goes in in step 3. Hope that helps! While your recipe is more affordable using a cheap cut of meat, I would opt for a beef tenderloin cut in strips, cooked quickly, and removed from the pan while the sauce is being constructed. I wouldn’t make Beef Stroganoff except for a special occasion, therefore the splurge on the meat, but regardless I feel the meat should be in strips not cubed.